Hey, guys ! Long time huh? So technology ... just when you start to think, okay now the developing technology is on hold, my articles come! Now the technology we'll be talking about is related to fishing! Yes, fishing! Fishing is something that most people find boring. But thanks to technology you can make fishing fun too. Today we have an 'underwater' drone: Power Ray. PowerVision is the company behind this underwater drone. 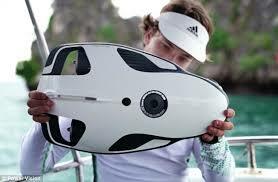 PowerRay is an underwater drone that can track, photograph and even bait a fish! Because of the sonar add-on, it can detect fishes and photograph them in 4K. It beams that information to a smartphone using Bluetooth. The drone-sonar combo has been the key to this product's success. Going into details, this combo is designed to send the details on water's landscape, fish location, water temperature (for both freshwater and saltwater fishing) as well as ice fishing !!! How cool right?! Talking about the drone's camera, it's pretty decent. The drone's on-board camera shoots 4K video and stills, transmitting in real time to a smartphone. Moreover, the camera captures underwater footage with a 100-degree wide angle lens, shooting 4K video at 30 fps or 12-megapixel still in 5 fps bursts. 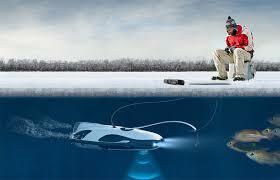 Some really smart technology we witness here is a light with a blue hue which is used to attract fish. 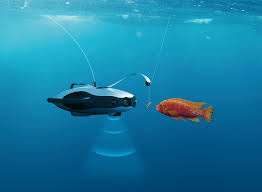 The drone can dive as deep as 98 feet and sonar accessory can track fish upto 131 feet. While the underwater drone is expected to hit the market by the end of February, PowerVision has not released the official price of this underwater tech wonder. I think that this a big step towards technology development! Stay tuned for more amazing tech!!! Well ... you will understand better about this product with the help of some visuals so a video is given below for the same.